This charming book hilariously illustrates that yoga isn't just for people anymore! A Sloth persuing total relaxation and mindfulness meditation demonstrate classic poses that would seem impossible to achieve, were it not for the photographic proof presented here. These sloth yogis are in no rush to complete their yoga sequence, it often takes an entire month just to complete a single pose. Sloth Yoga takes this popular meditative practice to a new level of Zen. Yes, yes, and yes! 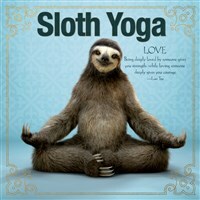 Paired with inspiring Zen, yoga and meditation quotes, Sloth Yoga is posed to inform and delight all human practitioners of the ancient discipline. What a unique way to bring humor and relaxation into someones life by giving them this unique book as a gift.